Typhoon Haiyan's Exact Death Toll May Never Be Known : The Two-Way veThe storm struck on Nov. 8 and some remote islands have yet to be reached. It's been difficult to get help to some survivors and to account for the dead. As of Tuesday, the official death toll stood at nearly 4,000. Among them were at least 5 Americans. In Tacloban, the Philippines, graffiti on the side of a grounded ship sends a message out to the world. The hard work of getting aid to survivors and accounting for the dead continues in the central and southern Philippines, which was devastated by Typhoon Haiyan on Nov. 8. Reuters writes that "the Philippines and international armed forces and aid agencies are struggling to get help to devastated areas due to the extent of the destruction, which has left 4 million people displaced." The good news, NPR's Russell Lewis reported earlier Tuesday from the scene, is that the airport in the heavily damaged city of Tacloban is now able to handle scores of flights per day. That means vital food, water, medicine and equipment are pouring into the area. The White House has created a "How You Can Help" webpage here. It includes this video appeal from President Obama. 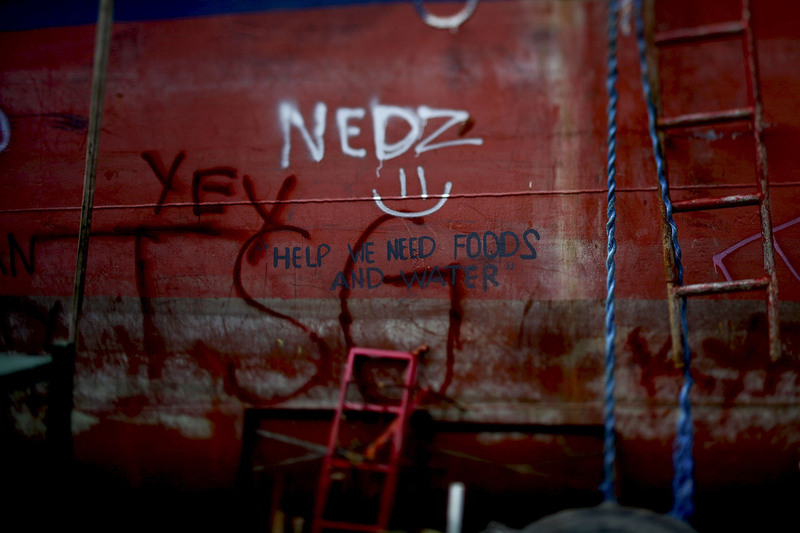 But aid groups, agencies and armed forces have yet to reach some of the remote islands. That means coming up with a final accounting of the storm's toll may be impossible. "It is unlikely we'll ever know" the exact number of people killed, Steven Rood, the Philippines country representative for the nonprofit Asia Foundation, tells NBC News. Still, the scope of the disaster and the challenge facing those trying to help is clear from the numbers that officials have come up with. The Philippine government's National Disaster Risk Reduction and Management Council says 3,982 deaths have been confirmed. At least 1,602 people are still missing, the council adds. The United Nations Office for the Coordination of Humanitarian Affairs says more than 4 million people have been forced from their homes and at least 13 million people were affected by Haiyan. Tuesday in Washington, State Department Principal Deputy Assistant Secretary Scot Marciel said at least five Americans were among those killed during the storm and that hundreds of others from the U.S. who were in the Philippines when Haiyan hit have received assistance. He also told the Senate Foreign Relations Committee that the U.S. is providing about $37 million in humanitarian aid to the storm's victims.